Wow -- I love the colors + design even more atop the door! 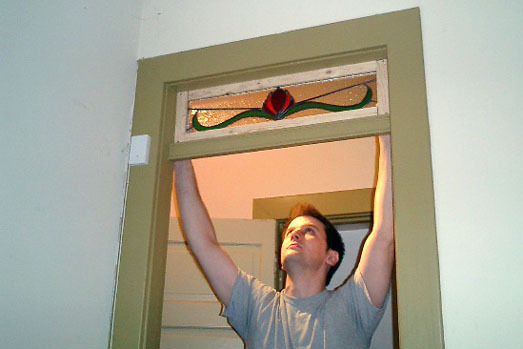 Nice stained glass transom window. Looks like the house was built around it. *grin* God bless cross-over traffic. I used to be just using Don for his breakfasts; now I'm just using him for his disgruntled readers. Michelle, that is gorgeous!! I also love my Christmas ornament, thank you again. You make me smile. Michelle, your transom looks great! Keep up the great work! Your glassing escapades are far more interesting than mine; I look forward to checking in on them!